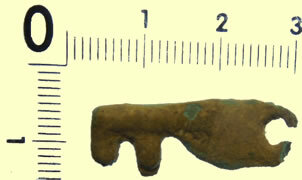 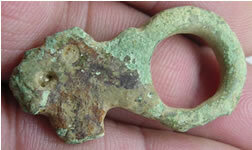 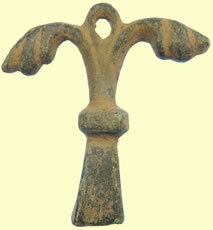 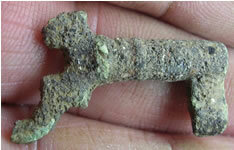 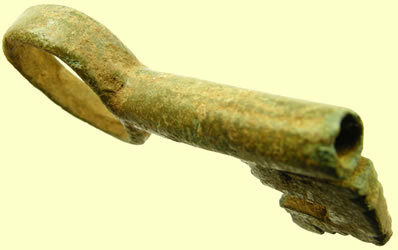 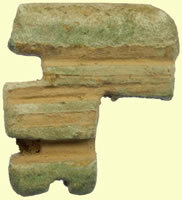 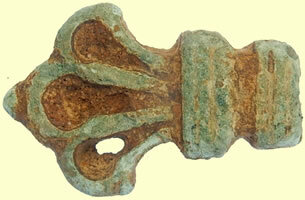 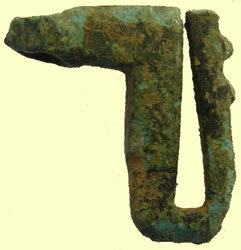 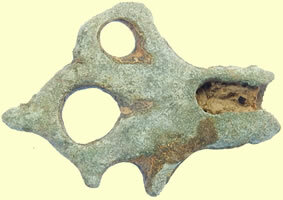 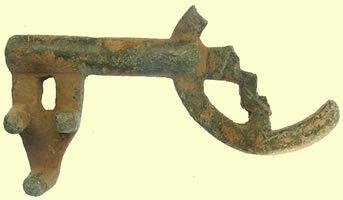 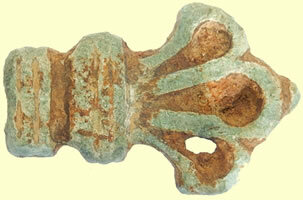 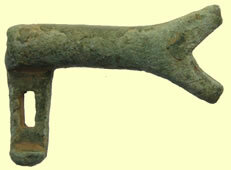 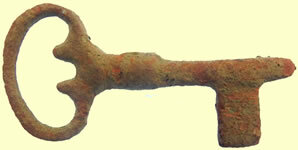 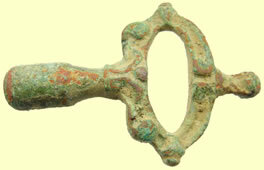 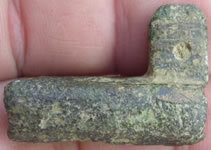 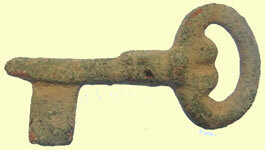 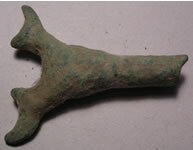 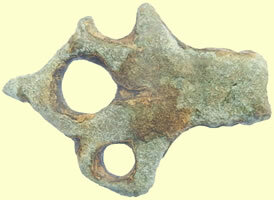 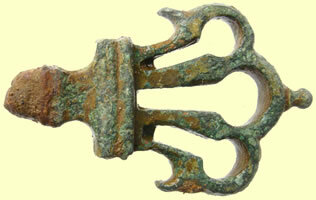 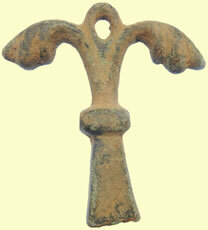 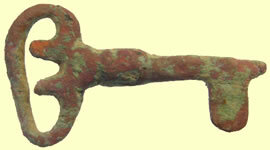 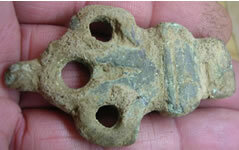 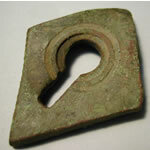 Early Medieval key handle circa AD 900-1100. 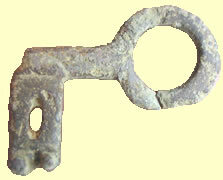 The attachment end is hollow and rectangular in section. 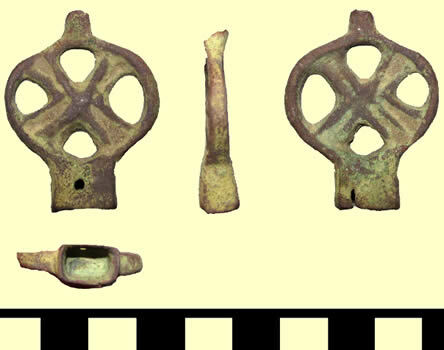 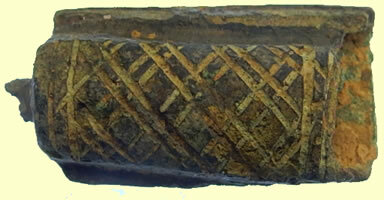 This is attached to an oval plate of openwork design formed by a cross.The four arms of the cross have cast raised longitudinal lines. 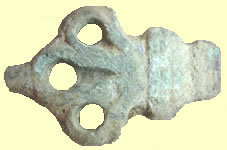 Both faces of the key handle are decorated in this way. 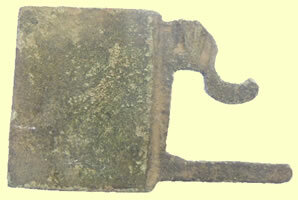 At the apex of the handle is a rectangular projection with a worn break. 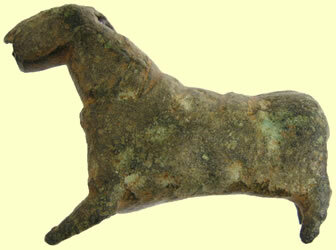 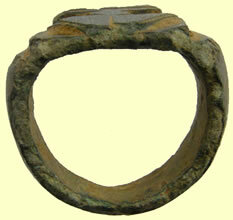 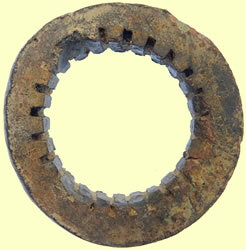 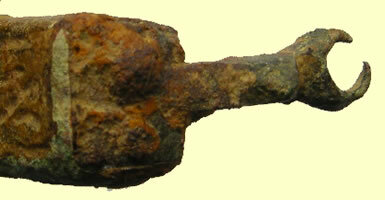 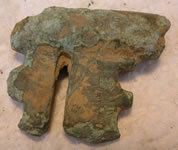 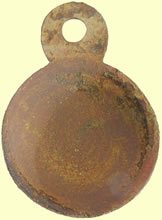 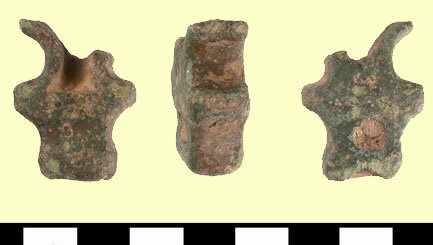 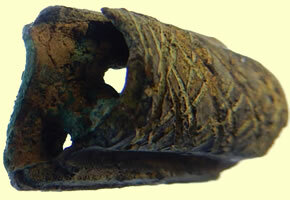 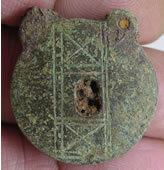 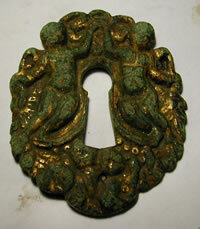 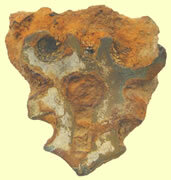 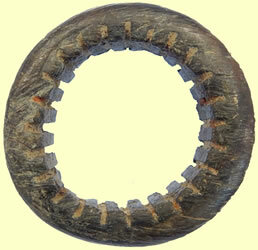 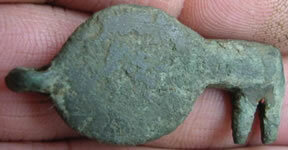 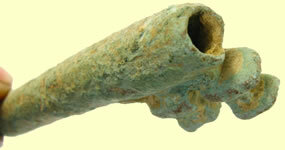 The object has a reddish brown patina typical of late Early Medieval period. 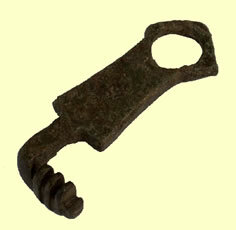 Length 40.25mm, width 31.43mm, thickness of attachment end 8.78mm, thickness of plate 4.88mm, weight 19.8g. 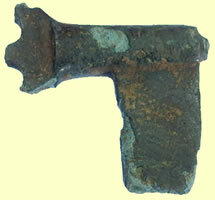 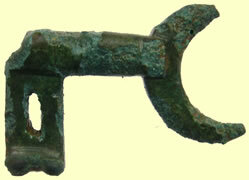 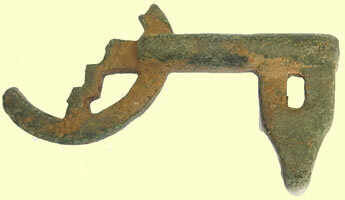 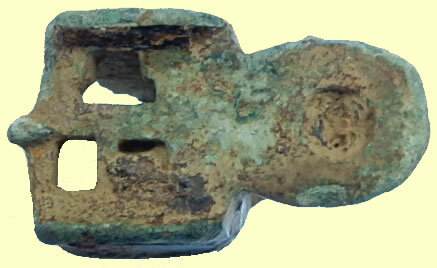 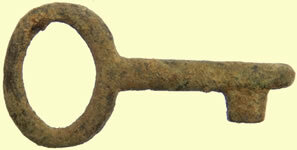 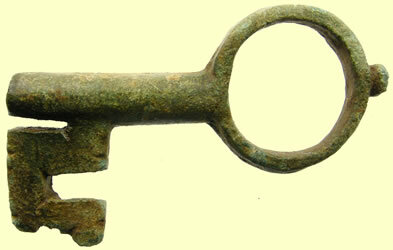 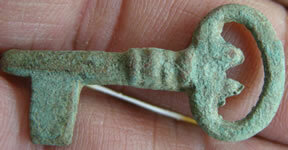 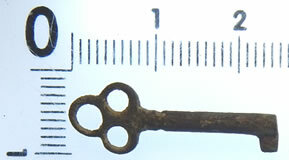 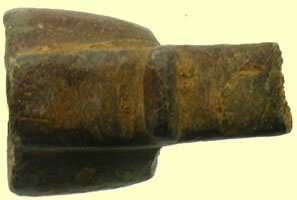 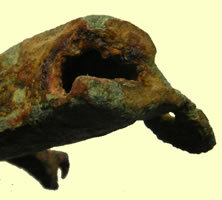 Copper-alloy slide key from a tumbler lock, of Winchester type 2. 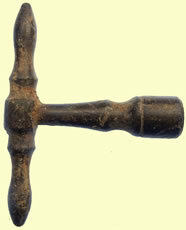 The stem is very short, and is pierced at the tip. 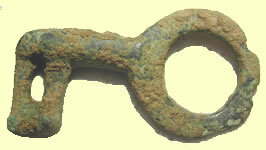 The bit is very long, and L-shaped; it has a rectangular perforation before two prongs project at right angles. 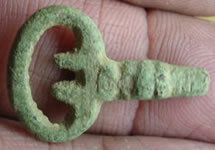 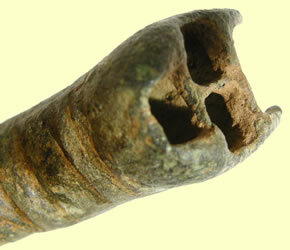 The key would have been put into a long keyhole and the hollow tip engaged onto a pin projecting from the bolt. 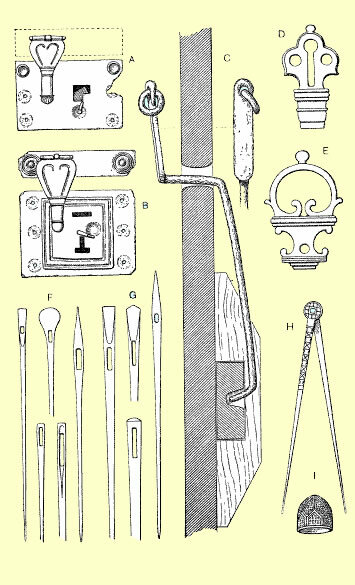 The key would then have been turned so that the prongs would have passed through a hole in the bolt and pushed a spring out of the way. 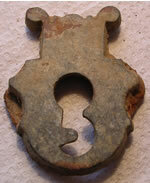 Then the key and the bolt would have been slid along in to open the lock. 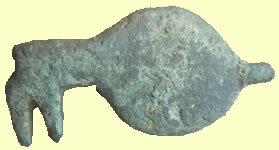 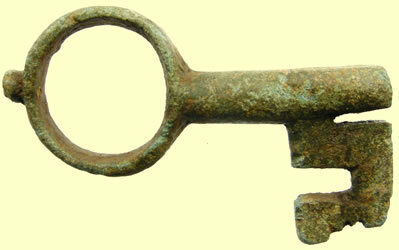 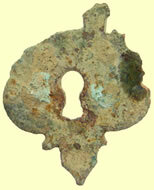 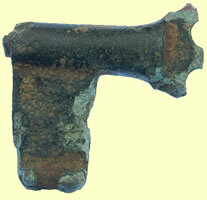 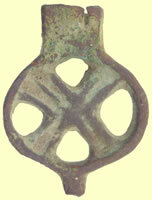 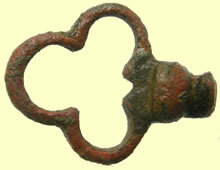 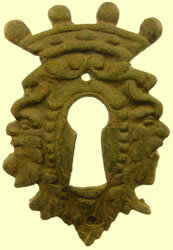 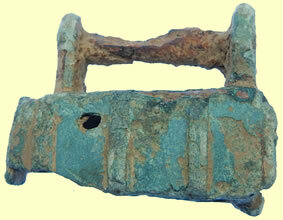 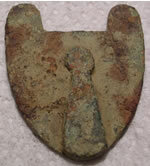 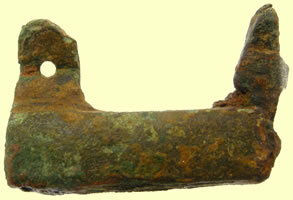 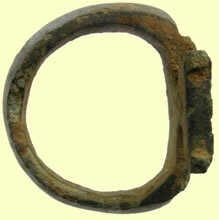 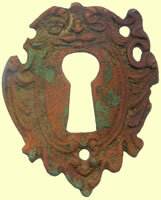 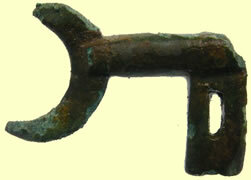 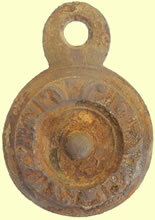 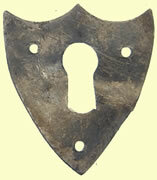 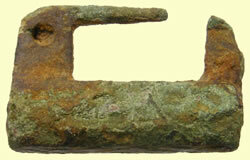 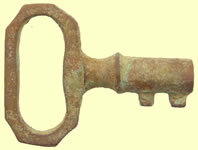 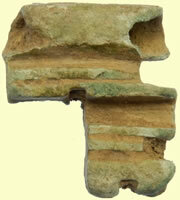 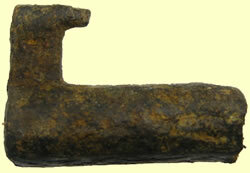 This type of lock was used in Roman and late Anglo-Saxon times, but did not outlast the Norman Conquest. 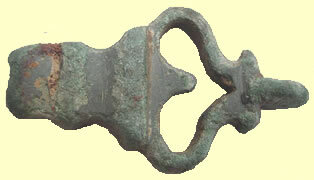 Locks of one kind or another have been used from ancient times for whenever man acquires desirable possessions there are those who are prepared to steal them. 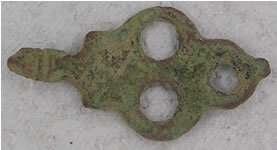 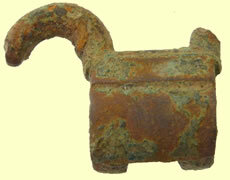 Barrel padlocks are known from at least the Roman period in this country but as they are generally made of iron they are rarely found in good condition. 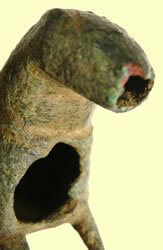 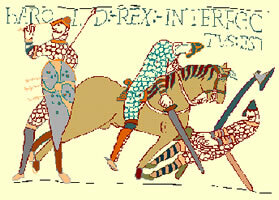 They are also used in the later Saxon and Viking period but again construction in iron means their survival rate is low. 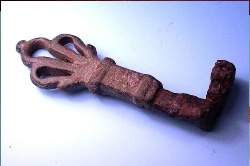 A complete 10th century example has however been found in Coppergate, York and it is on display at the Jorvik Viking Centre.1 It is of a larger size with more complex construction and decoration than these later Medieval examples but in general the operating principle remains the same. 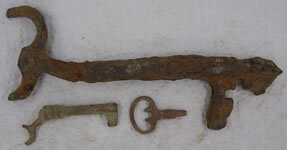 They consist of two quite separate and detachable parts, one a cylindrical barrel with a bar above and the other the bolt. 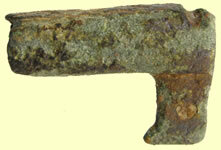 The bolt is a device with barb-springs that catch internally behind a stop within the barrel and a socket that engages with the external bar over the cylinder. 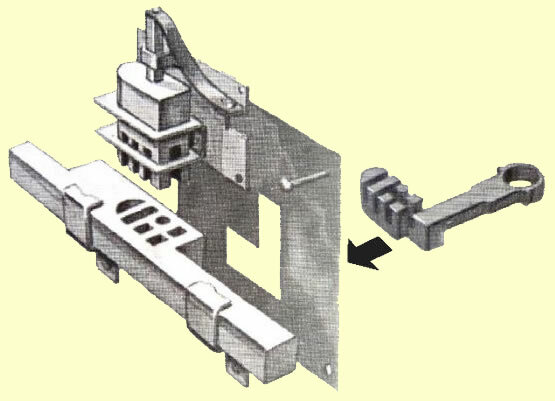 In this position the lock is closed and requires a key to release the mechanism . 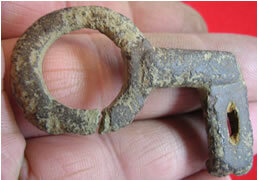 The key is inserted through an opening, often 'T' shaped, in the end of the barrel . 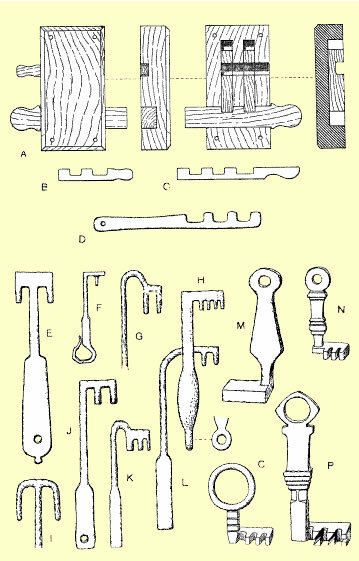 Inserting the key compresses the internal barb-springs to a level below the stops in the cylinder and thus allows the bolt to be withdrawn. 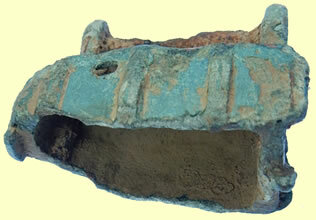 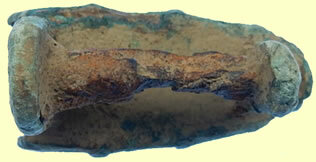 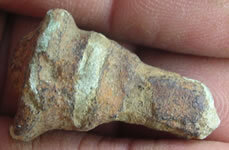 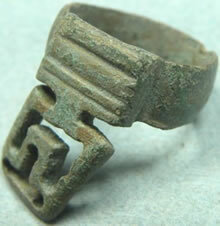 Copper-alloy, 29.77 grams, 32.48 mm. 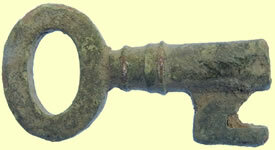 Circa 16th century AD. 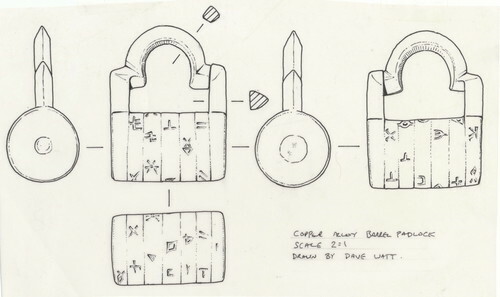 A very early form of 'combination lock' utilising five disks once rotating about an axle with lettering on each to release the locking bar. 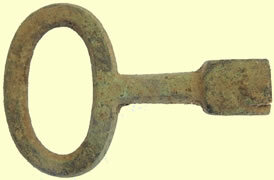 The hoop of the lock in the form of two uprights connected by a semi-cirular central section; one upright being removed when the lock was opened. 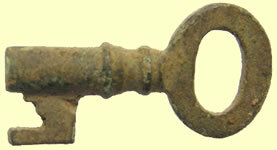 In addition, symbols are also to be seen on the two fixed ends of the lock cylinder. 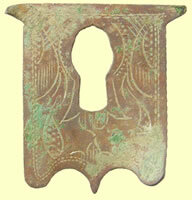 (this lock and also referring to two very similar examples from Suffolk and in the British Museum). 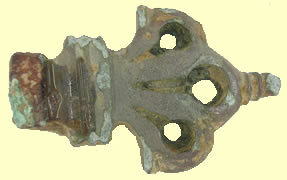 See the PAS entry for full details of the lock symbols, taken from an x-ray image. 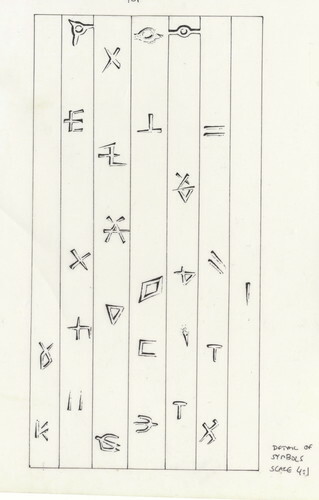 A most unusual, intact and extremely rare item with the use of symbols in place of normal letters seemingly unique.